C'mon. That's like the best quote ever. A friend of mine told me that yesterday. Heh. Oddly, a friend who knows not of my bear obsession. 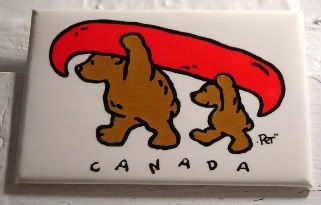 Actually, I picked this magnet for two other reasons as well. First, the canoe. Today is Iron Eyes Cody's birthday. He would have been 105 years old. For those of you who don't know - Iron Eyes Cody was the guy in the Crying Indian PSA for Keep America Beautiful that my company produced back in the 70s, which debuted on the first Earth Day in 1971. Remember? The booming drums, dramatic music, and Iron Eyes in full Native American regalia, canoeing down a river, beaching his canoe, and walking to a roadway shoulder, only to get pelted by polluters and their fast food - cut to a lone tear falling down Iron Eyes' forlorn, stoic face. Sounds cheesy, I know. But, without tooting anyone's horns, to this day, it's still widely regarded as one of the most memorable and successful commercials ever, as well as one of the most effective awareness campaigns. Mind you, we're in much the same environmental boat (/pun intended) nowadays, but it's certainly not for lack of trying. Second, the canoe again. It reminded me of that surprise ER cameo that George Clooney did back in the day. Remember? In Seattle, he was lookin' all hot, wearin' flannel, and workin' on his boat, when Carol came around the back of the house. Hot. I knew in my head that he wouldn't be on last night's ER series finale, but in my little heart of hearts, I expected Doug to show up in a tux at the Carter Center gala, then in jeans at the bar, then in shorts for one last pick-up bball game, and even to the very end, in his yellow smock, rounding the corner of the ambulances, asking Carter to get a move-on. 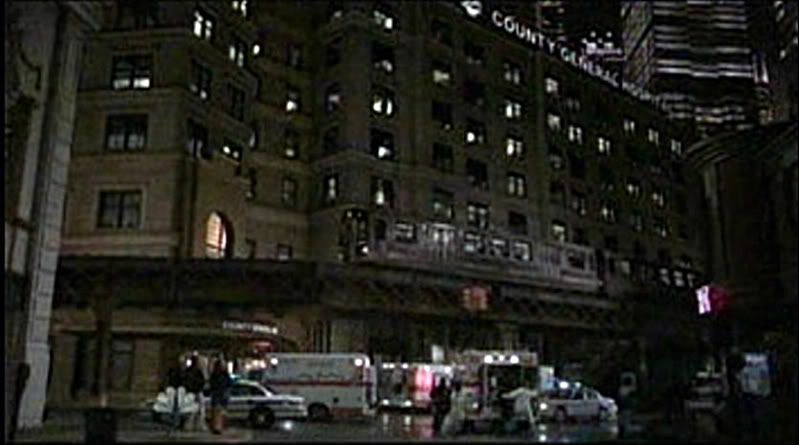 So, even though ER spent a small bundle on that wonderfully executed CGI wideshot of County General (photo by bethie, thank you), I was a tiny bit disappointed when my boyfriend didn't show up. What? You were, too. Admit it. 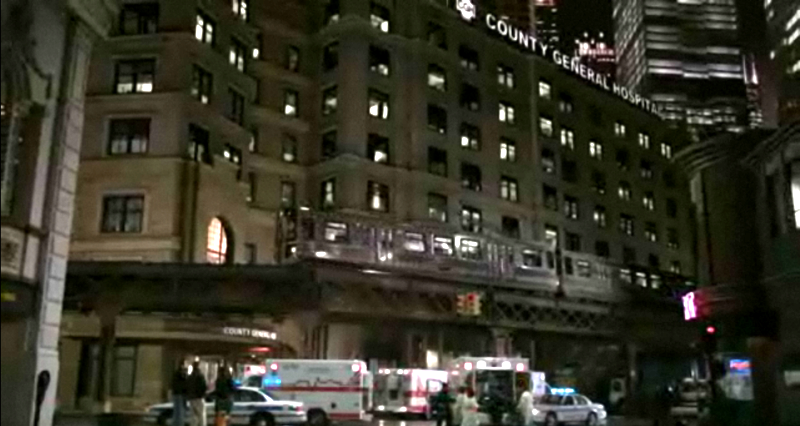 A whole eta, because I'm still marveling over that gorgeous CGI wideshot (screencap from the NBC player) of County General. It just was a simple overlay, but here's what's really there. Finally getting to see County General was fantastic. 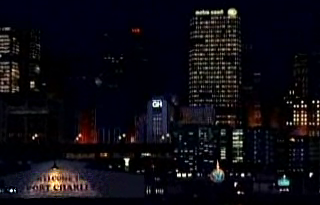 Kind of like when General Hospital: Night Shift first revealed the Port Charles skyline, General Hospital and the waterfront in their opening titles.